We filled up in Albuquerque, New Mexico, with B20. Since we've mostly been buying blends, the prices have been quite close to what you might pay for gasoline. "Bio" might've even been a touch higher in some places we've stopped. Remember, demand sets price, and there's a huge demand for all fuels right now. 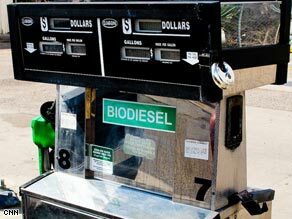 The only way biodiesel would be cheaper was if no one wanted it. You did pretty good in the turbine interview for two hours sleep. Happy and Safe Journey.....hope CNN throws the two of you a welcome party. People are very price sensitive. But not easy known, is miles per dollar. All the confusing standards, where is the standard of Bang for the Buck ? Carbon Footprint, Eco-Ethical Index, all calculated, into your original tax sin. Coming soon, all spelled out, in the latest version of the Newest Testament. What the author fails to mention, is that even though it's almost the same price as gasoline – the diesel cars that run this fuel get much better mileage than standard gasoline engines. CNN always has to put their spin on things to appease big oil/big government and never has an honest story that can help the average citizen. All of you people with water between your ears. Explain which is your preferred water option ! Numerous possibilities. KWH per dollar ? Miles pr dollar ? I can say just add air, but how power to tire meets the asphalt ? The 9/11 Truth Movement link has a valid point, that standards, and their interpretations, have asymetrical effects, fertilizing the International Tapeworm. The problem is it's our government's fault. They are ruining the world's food supply by trying to make a fuel that can not compete with gasoline and takes more fuel to make, than is saved by using it. Right now there is a small window for harvesting corn and the environmental hazards when it comes to harvesting it i.e. flooding, tornados that can ruin entire crops before anyone thinks of collecting this crop that sustains the entire world, make it almost worthless as a sustainable crop. The solution... Algae, it can be turned to ethanol much more cheaply than corn. It can be farmed the whole year 'round so while you have one small yearly harvest for corn, once you harvest your algae, you can fill the tank right back up(with the correct heating in your storage area) and harvest multiple times a year. Our government is using the food staple corn as a means to control it's population and in turn the populations of many other countries. This is no different than King Mugabe of Zimbabwe forcing out the white farmers to bring starvation and suffering to his own people. So many problems lay ahead. What’s going to happen if the "masses" start using other forms of "fuel" which is hard to tax? Cars running off of water would be great, but when people start filling up from the rain fall the night before, where do local governments start getting the funds to repair or build new roads? Does that mean if we start using "less expensive/renewable energy" other taxes go up? More tolls go up? Registration fees go up? Your point is correct, the government edicts are killing US, and others. The Algae option has numerous, positive, unintended, possibilties. Sewer treatment, raise fish, put greenhouse on top. Get people back into the countryside. Yeah... algae. It could use the gas from trash to grow and then be fed to livestock after if was mashed up to make the oil. What a concept. I also like the idea of solar cars.... they would not work everywhere but within about 400 miles near the equator but think of all the green house gases would could save. They have a race ever year in the outback. I wold buy one... I live in South Carolina... we get tons of sun. Plus... Just got back from a road trip out west.... loved all the wind mills in Texas.... I want one for my back yard. For Solar, lot of parking, charging, for millimeter driving. Long time to pay for the cost of the Solar Panels. High efficient, 2 square meters, one horsepower, to charge your batteries. Stranded, camp out for a week, drive a little, and camp some more. The experimental Solar Racers, price and inconvenience, for the first prize. BioDiesel, Per liter, little more; Per weight, less. But, diesel efficiency is greater. Diesel wins, due engine efficiency. Burn oil-gas from dinosaurs, oil from chicken fat, algae, vegetable oil. Convenience, avaibility, miles per dollar, were the deciders. Government regulation, energy policy and subsidy, need imaginary number calculus, conformal mapping, wrong answer ? Where is Willie ?